1 white male age 26-44 [Adam]. 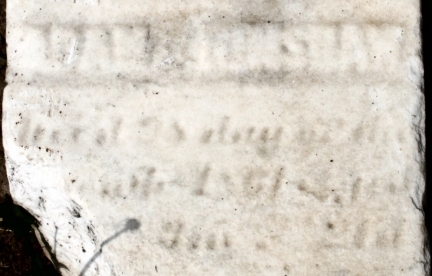 1 white male age 45+ [father William?]. 2 white females age 26-44 [sisters?]. 1 white female age 45+ [mother Rachel?]. 1 white male age 30-40 [Adam]. 1 white female age 30-40 [Sarah]. 1 white male age 5-9 [Benjamin]. 1 white male age 40-49 [Adam]. 1 white female under age 5 [Susanna]. 1 white female age 5-9 [Rebecca]. 1 white female age 30-39 [Sarah]. 1 white female age 80-89 [mother Rachel?]. Adam Hinshaw, age 61, born in Randolph County, North Carolina; farmer; $150 real estate. Sarah Hinshaw, age 49, born in Randolph County, North Carolina; cannot read or write. Benjamin Hinshaw, age 19, born in Guilford County, North Carolina. Rebecca Hinshaw, age 16, born in Guilford County, North Carolina; attended school. Susanah Hinshaw, age 14, born in Guilford County, North Carolina; attended school. Sarah Hinshaw, age 60, born in North Carolina. 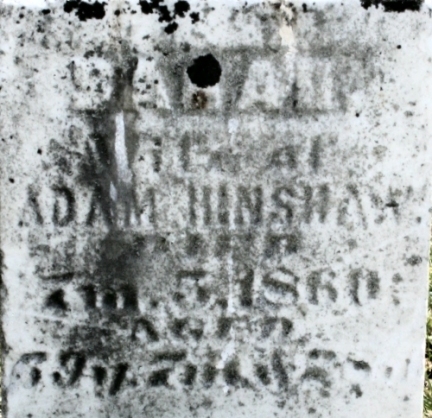 Benjamin Hinshaw, age 28, born in North Carolina; laborer. Rebecca Hinshaw, age 24, born in North Carolina. 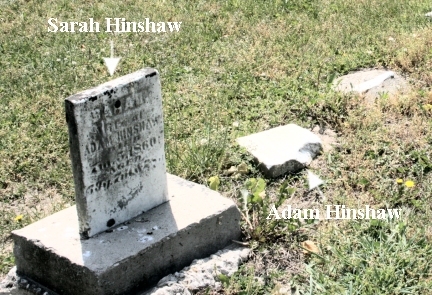 At Providence Friends PM Cemetery, Providence Township, Randolph County, North Carolina, there is a record of the burial of two Hinshaw children, both recorded only as "child of Adam" [Hinshaw].13 This is the only known Adam Hinshaw that fits with the recorded dates, One child is recorded buried Sep 23 1829 (note from the date this was their first child, possibly stillborn), and the other child is show buried Sep 6 1843. These two children were in addition to known children Benjamin, Rebecca and Susanna. 1850 census, Guilford County, North Carolina; roll 632, page 269, dwelling #6. 1820 census, Guilford County, North Carolina; roll M33-85, page 89. 1830 census, Guilford County, North Carolina; roll M19-121, page 121. 1840 census, Guilford County, North Carolina; roll 361, page 248. 1860 census, Carmel P.O., Washington Township, Hamilton County, Indiana; page 321, line #34, dwelling #738, family #738. 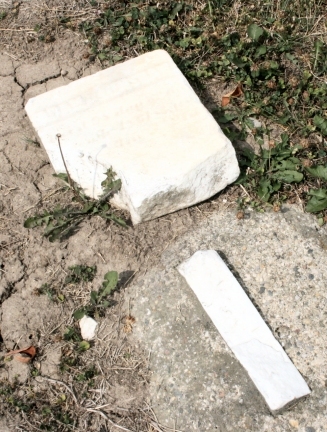 "Piedmont North Carolina Cemeteries, Volume IV". Mr & Mrs L S Hornaday Jr. Published 1991 by L S Hornaday, Burlington, NC 27217.